Just a few days ago it was confirmed after months of rumours, that nine years since the iconic handset was taken out of production, the much-loved Motorola Razr will be returning in a rebooted form. Now, in a turn that's sure to delight fans of the original handset, newly revealed images show just how true to its original form the 2019 Motorola Razr will be. The images, which were reported by GSM Arena, show a patent which Motorola was recently granted, and provide a detailed look at the Razr's form factor. On the outside, the phone remains pleasingly similar to the original, with its rounded top and bottom. The case also features a small secondary display, just as the original had. On the inside, things get a lot more modern. 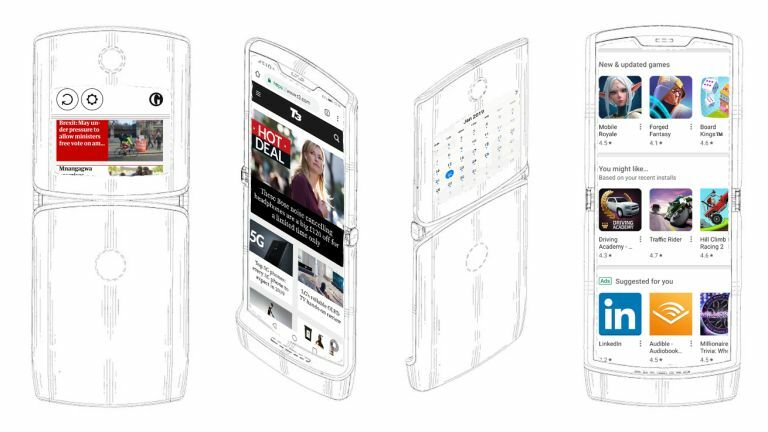 We now have a foldable screen that runs the length of the handset, meaning the the Razr will be much more than a retro novelty. There's a notch in the top of the screen for the earpiece, and probably a selfie-camera, and there are two more cameras on the outside (or perhaps the lower circle is a fingerprint scanner, as that would seem a sensible place to put one). The good news is that rumours say that the 2019 Motorola Razr will be officially unveiled at MWC 2019 next month, where it will surely invite direct comparisons with Samsung's folding phone, the Samsung Galaxy X, which also has a screen which folds inwards. The bad news, according to GSM Arena, is that the new Razr won't won't go on sale worldwide, and will be only launched as a $1,500 (about £1,160) Verizon-exclusive with a limited run of 200,000 units. In terms of specs, we know nothing of what's under the bonnet of the reborn Razr, but with its svelte form factor, we think it's unlikely to be a 5G phone. If it does get announced at MWC, we'll find out those specs soon enough. This year, the annual show, which takes place in Barcelona, runs from Monday 25 February to Thursday 28 February. Will the new Razr generate the same levels of hype at this year's MWC as the retro Nokia 8110 banana phone did when it was shown off at MWC 2018 last year? No doubt Motorola is banking on just that.